Nutter Butter acorn cookies are so easy to make! Kids can do much of the prep work on their own. 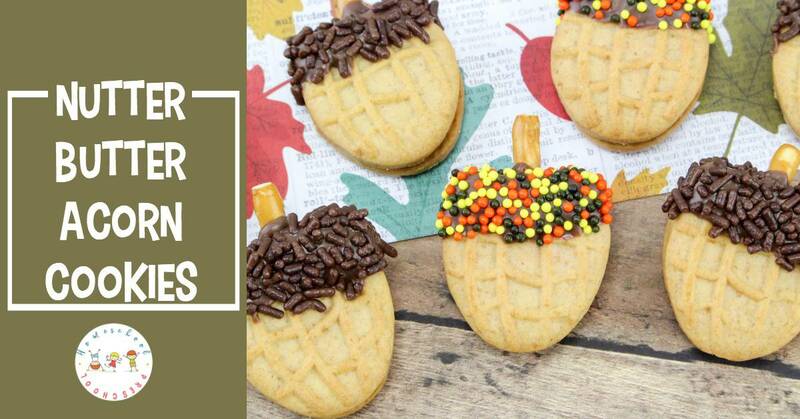 These cookies are perfect for your fall preschool themes and parties. These acorn cookies for kids are so tasty! Start off with a Nutter Butter, add some chocolate and sprinkles, and you’ve got a tasty treat for all your autumn gatherings. They’re perfect for class parties, family gatherings, or just a fun afternoon snack the week you study squirrels and acorns in your homeschool preschool. Acorn cookies are so easy to make that your preschoolers can pitch in and help you in the kitchen. 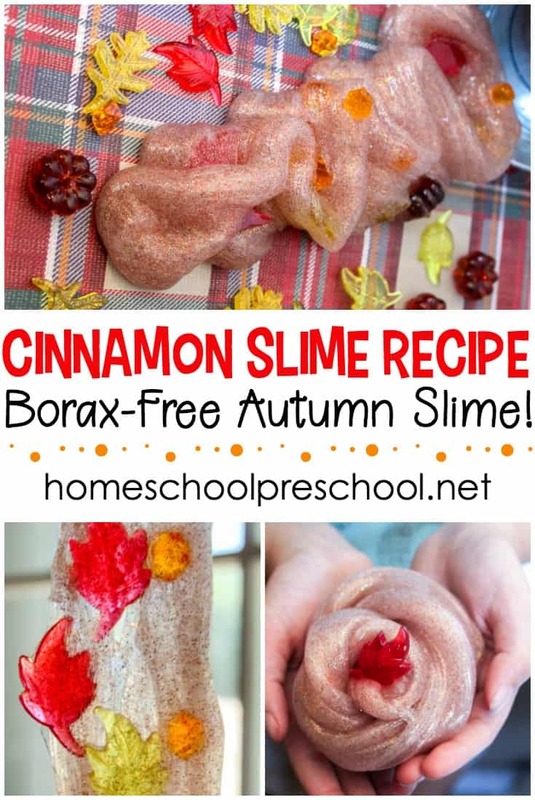 Older preschoolers and young elementary-aged kids may even be able to decorate them independently. I don’t typically write about food on this blog. However, when I find an idea that preschool moms can easily incorporate into their lessons, I want to share it. And these Nutter Butter acorn cookies fit the bill. 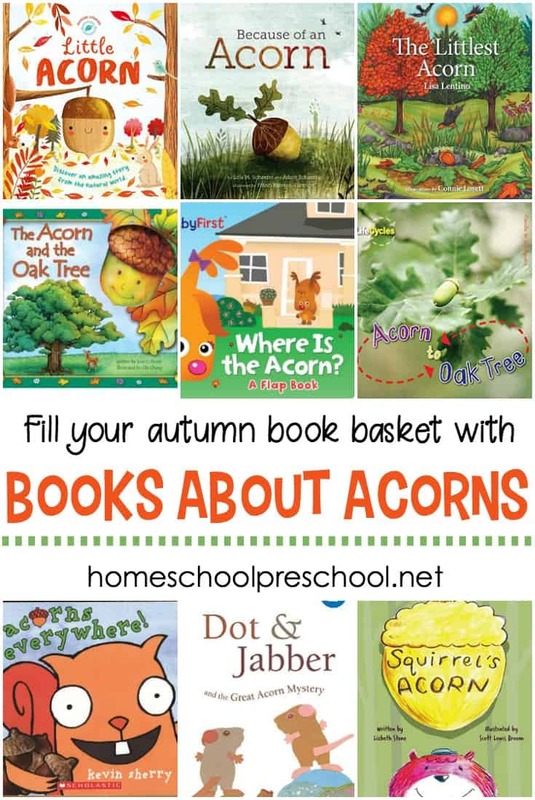 They fit nicely in your autumn unit studies – acorns/squirrels, fall leaves/trees, and Thanksgiving. Or, make a big batch of them for your Thanksgiving celebration. Cut each Nutter Butter cookie in half. Older preschoolers can do this with a butter knife if they’re familiar with using one safely. Melt the chocolate candy melts according to the directions on the package. Dip the cut end of each Nutter Butter cookie half in the melted chocolate candy. Dip the cookie so that the chocolate goes about 1/4 of the way down the cookie. 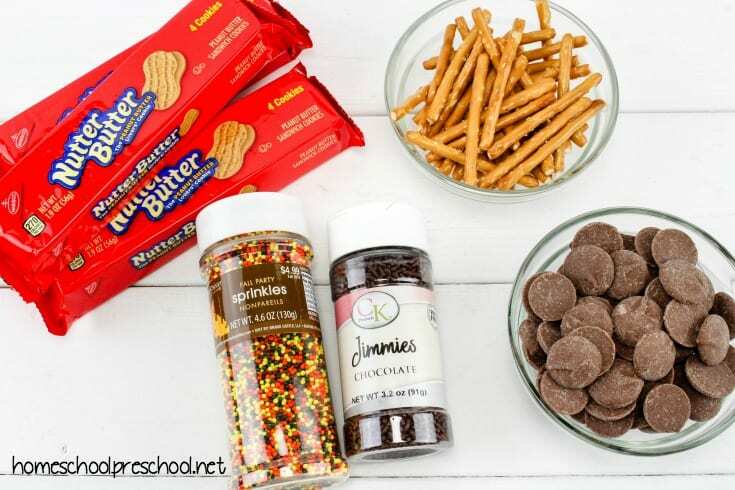 Before the chocolate has a chance to harden, sprinkle them with jimmies or other fall sprinkles. This is where your youngest preschoolers can pitch in. 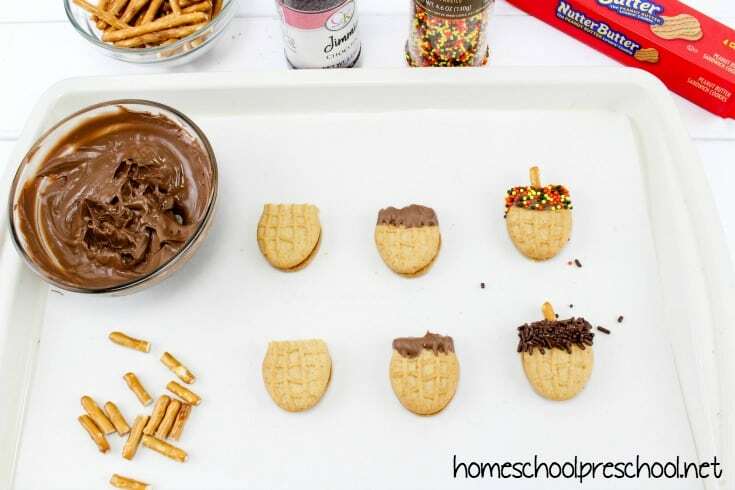 They’ll love helping you decorate these fun acorn cookies. Break off a small piece of the pretzel stick to use as the acorn stem. If your chocolate has already hardened at this point, dip the pretzel in the chocolate to make it stick. Now they’re ready to eat! Serve them for an afternoon snack or bag them up for your class party. You could even spread them out on a fun fall platter for your autumn celebrations. 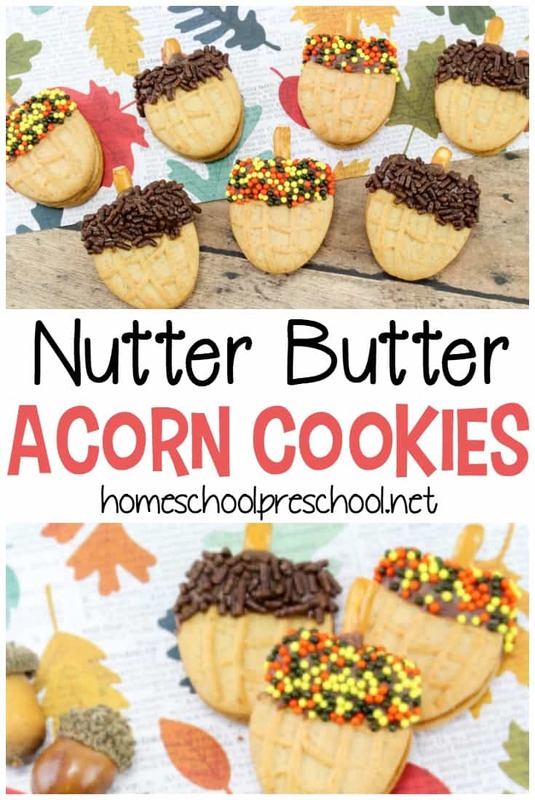 Where will you serve these Nutter Butter acorn cookies? 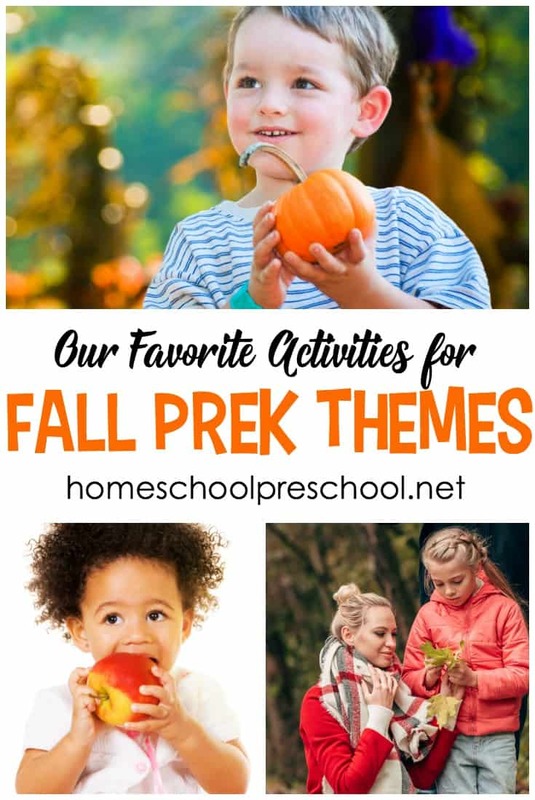 Will you add them to your next autumn preschool theme? Or, will you serve them at an autumn gathering?